Grayson, a childhood acquaintance, is now an arrogant, self-centered ladies’ man whose face is plastered all over the cruise’s advertising campaign. Emma can’t seem to turn a corner without seeing his stupid, conceited face. Nevertheless, when Grayson starts seeking her out, platonic badgering becomes sexual teasing and Emma discovers she’s not as repelled by Grayson as she thought. In fact, she can’t help but notice the real man beneath the haughty exterior. 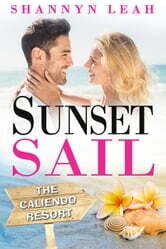 Suddenly, a three-week cruise fling with a Cohen man is exactly what she desires, but will walking away from him when it’s all over be as easy as she’s convinced herself? I really enjoyed this “sort of” enemies to lovers story! Emma is not a fan of Grayson. He’s a complete womanizer and she intends to ignore him completely on the cruise she’s been forced to attend as her family and his go into a merger. What she’s not prepared for is his witty nature and his warm charm or the way her heart and body react to him. Grayson has a past that is steeped in deception. He will never give his heart to a woman. Yet, when the opportunity to have a friends-with-benefits cruise affair with Emma presents itself, he throws himself completely into it. As long as Emma doesn’t allow her feelings to get involved, everything will be fine and they will go their separate ways at the end of the cruise. I totally understood Emma’s judgement of Grayson as that was the only persona he presented to the world. But I cheered as she began to open herself to the possibility that there was so much more to him than what was on the surface. Grayson had a lot, a LOT, to overcome and my heart hurt for him and for the sucky hand he had been dealt. There’s a lot of family drama here along with some other woman drama as well. The writing has a very nice pace and it never felt bogged down. The steam factor is mild and is fade to black. Secondary characters shine and truly add to the total enjoyment of the story. I would have liked a nice epilogue but as the series continues I’m hoping we get a further glance at how this couple manage to make a relationship on land work for them. Altogether, a very nice read that isn’t heavy with angst but has just enough to keep the story moving.